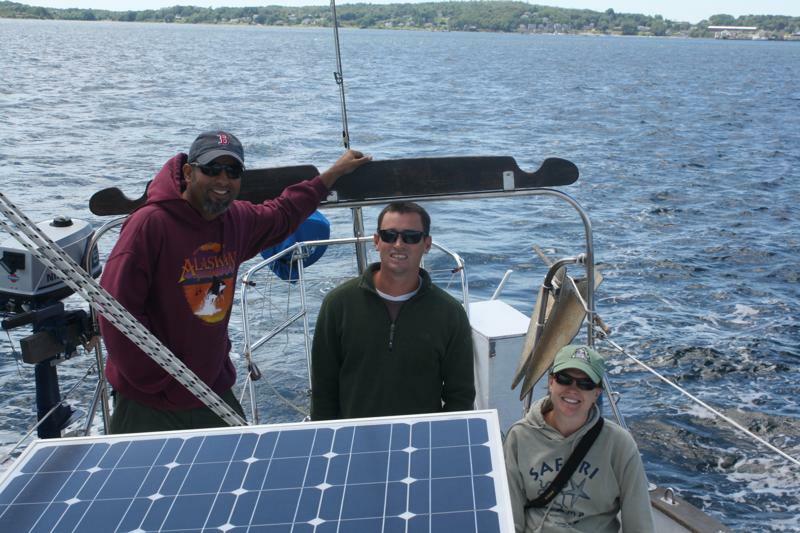 Sailing, Lobsters, Beer AND Fun Facts…What a Day! Brian and I were feeling right at home while camping with Sunny and Berkley. We’d been cooking on a propane stove, washing dishes with water from the spigot, keeping our food chilled in an ice box, and sleeping in twin bunks. Not to mention it was cold outside! Lucky for us the campground had ample hot running water and we took full advantage of the showers. We could walk in and out of the little cottage without stepping foot into a dinghy…this place was almost too good to leave! But Sunny and Berkley are all too familiar with campgrounds and hiking trails, it was time to get them out on the water. It was a beautiful day for sailing! After a quick refresher tour of the now very lived-in Rode Trip, we hoisted the anchor and set out from the harbor for a bit of sightseeing on the waterfront. 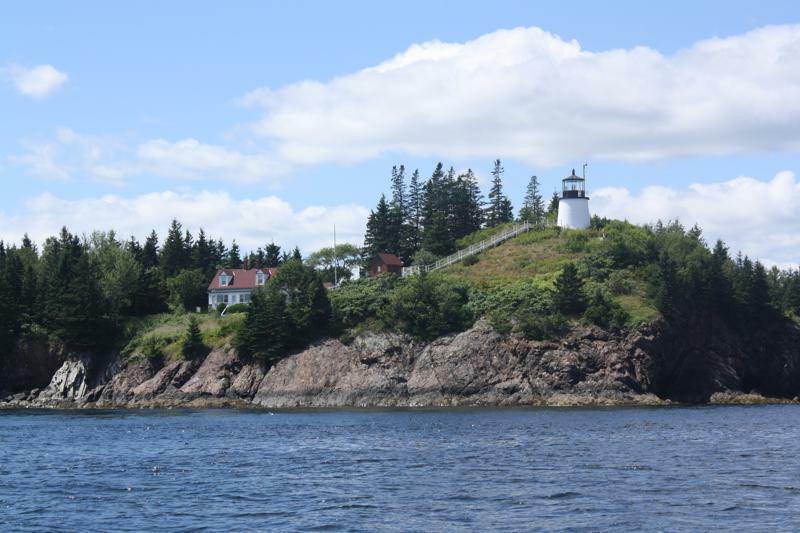 We had a beautiful sail around Owls Head Lighthouse and through Owls Head Bay to circumnavigate Monroe and Sheep Islands. See our track. 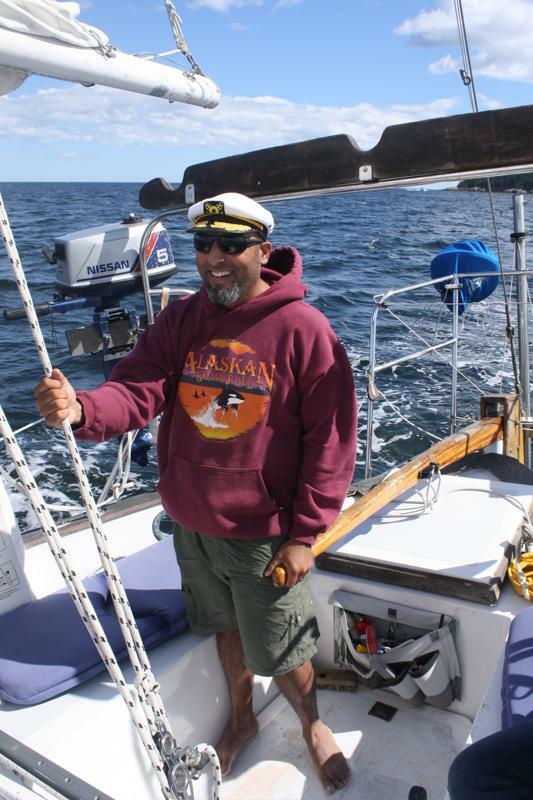 Sunny took a turn at the tiller and within minutes, without hitting any lobster pots, he was promoted to Captain! Berk and I sat back and let the boys do the work while we schemed about how to get ourselves aboard a passing yacht. Back at Rockland our space was still wide open and we anchored Rode Trip as quickly as possible. While I was still attaching the snubber line, Brian was launching the dinghy into the water and sails had been left untended. Why the rush? We’d planned a lobster feast tonight only we hadn’t yet gotten the lobsters! Now we had about fifteen minutes to get to the docks before 5:00pm closing time. Brian continued to ready the dinghy and Sunny came up from the cabin to join him on the race for shore. Meanwhile, Berkley came up from the cabin to help me fold and cover sails. Then we went back down for some girl time; complete with prepping potatoes, eating cheese, and showcasing Rode Trip’s stash of beach bounty. Success! The boys had returned with a fabulous sampling of beers! Mmmm…Baxter IPA, Southern Tier Double Milk Stout… Oh, right, as for the lobsters…while they didn’t exactly have to hunt lobsters themselves, the docks were indeed closed and they did a bit of searching for the next best option before returning with six scrumptious looking soft-shelled lobsters. Shortly after Brian and Sunny returned to the boat, Scott and Kim joined us for dinner. This would be their first New England lobster experience and they were in for a treat! Not only would they dine on sweet, succulent lobster (which we still think is sweeter than the Caribbean cousin) but Scott, Kim, and all of us would get a lesson in lobsters from local expert, Sunny his lovely assistant, Berkley. 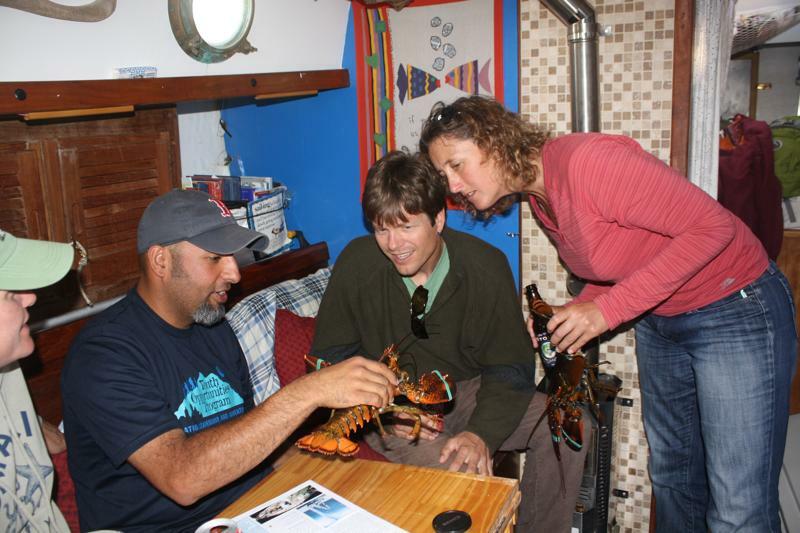 Thanks, Sunny, for these interesting lobster facts! 1. Lobsters grow by molting. This means they grow a new exoskeleton inside their bodies and then come out. Thus soft shell lobsters are newly molted and sometimes have more water and space inside their shells and less meat (which is why soft shells are cheaper). 2. Lobster men put rubber bands on lobsters’ claws not only to protect themselves (and us) from the crusher and pincer claws, but also to protect the lobsters since they can be cannibalistic. Imagine if your lobsters ate one another before you had the chance to drop them into the pot! 3. During colonial days lobsters were used to feed prisoners. They were essentially poor people’s food. Thankfully for Caribbean cruisers, they still are poor peoples’ food. 4. Lobsters have various ways to protect themselves from predators. They have specialized eye ducts that shoot urea out; so essentially they pee out of their eyes. Gee, if that doesn’t ward off predators I don’t know what else could! But they might also protect themselves, against those pee hardened predators, by flapping their tails to swim backwards. 5. Lobsters are at least 7-9 years old before they are large enough to eat. Once again, we’d connected friends and were having a great time getting acquainted and sharing new experiences. 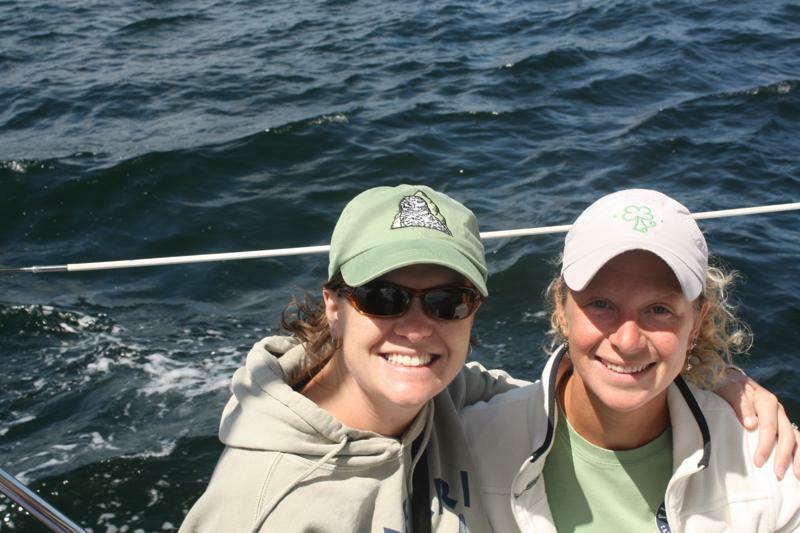 This entry was posted in Uncategorized and tagged caribbean lobster, lobster bake, lobster facts, monroe island, new england lobster, owl's head lighthouse, owls head harbor, rockland maine, sheep island by stephanie. Bookmark the permalink. Enjoyed this post! I learned to love lobster in ….yes…..Cleveland, Ohio!!! Ah, this museum was also highly recommended by one of our local friends…but we hadn’t the time to check it out on this trip.